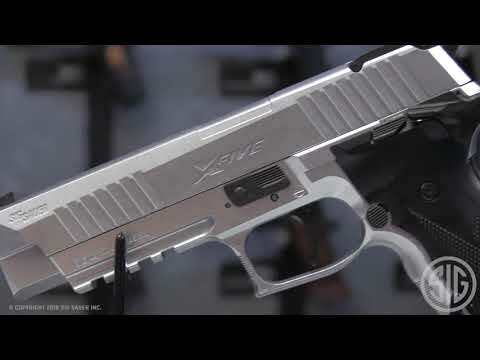 The X-Series from Sig are enhanced models intended for competition. This version is based on SIG’s signature handgun, the legendary P226, which is carried by military personnel, worldwide. Where the X-Five differs from its the standard P226 is in the grip, which features a deeper trigger guard undercut, a higher back strap and an extended beavertail. This gives a higher grip which is better for recoil management. It also comes with a magazine funnel (magwell) to facilitate faster reloads and all X-Five's have a straight trigger that breaks at 90°, for an better feeling pull. They look thoroughly futuristic, and are visually well-balanced and stand apart from just about every other pistol. These semi-automatic air pistols are produced in Japan and are of the highest quality. They give an amazing shooting experience, deliver remarkable realism and true to the original they carry authentic markings. Powered by a 12g CO² cylinder that fits into the pistol grip, they fire .177 lead pellets from a 20 shot, drop out magazine. The barrel is rifled steel and it delivers constant accuracy, shot after shot. They also feature a realistic 'blow back' action and a weaver mounting rail for the fitting of additional accessories such as a torch or laser.